An artist's conception of the hot Jupiter planet HD188753b (upper left), as viewed from the surface of a theoretical moon. The planet orbits a triple star system located 149 light-years away, in the constellation Cygnus. In the early 1990s, the idea of planets around other stars was squarely in the realm of science fiction. Now, astronomers have already confirmed thousands of extrasolar planets — exoplanets, for short — and we've barely begun the search. In this edition of Mobile Astronomy, we'll look at how they are discovered, whether they could host life and how you can use your astronomy app to see some of the host stars with your naked eyes or backyard telescope. Plus, we'll highlight some exoplanet apps filled with the latest news and data. To make them easier to envision, exoplanets are categorized by comparing them to Earth's own family of planets. At the large end of the scale are the super-Jupiters: massive gas giant planets between one and 10 times the size of Jupiter. Below this are the Neptune-size planets, which may be gaseous, icy, rocky or a combination of all three. At the lower end of the size scale are the super-Earths and the smaller, Mercury-size rocky planets. How do we detect exoplanets? Apart from a few special exceptions, directly observing planets hidden in the glare of their stars is beyond our current technology. So we have to rely on indirect methods to detect and characterize them. By far, the easiest methods involve measuring the small effects that the planets have on their star. The most fruitful of these techniques has been transit photometry: measuring the dimming of a star's light when its planets pass between us and the star. Radial velocity and stellar astrometry are two alternative methods, which detect the subtle motions of stars caused by orbiting planets tugging on them gravitationally. Which method is used depends on the orientation of the planetary system. When stars form, they retain a rotation direction determined from the angular momentum of their original source gas cloud, and their planets' orbits sit in the same rotating plane. The angles are completely random, and independent of the plane of the host galaxy. If we could look up at the stars and see their solar systems, they'd be oriented in all possible directions — some face-on to us (like archery targets), some edge-on at any angle of the clock, and every combination in between. Our solar system is almost edge-on to the center of our galaxy, but it's tilted 62.6 degrees away from the Milky Way's plane. You can demonstrate this in SkySafari, and some other astronomy apps, by enabling the galactic coordinate system option in the app. By displaying the coordinate system of our Milky Way Galaxy in the SkySafari app, we can illustrate that the plane of the solar system, as indicated by the yellow ecliptic line, is almost in line with the galactic center (red star) and rotated 62.6 degrees away from the galactic plane. In the small percentage of star systems oriented edge-on toward Earth, the planets pass in front of the star, temporarily causing a slight reduction of the star's light (on the order of 1 part in 10,000) as viewed from here. The amount of the reduction is proportional to the size of the planet. The dip in light recurs every time the planet completes an orbit. By recording the brightness of the starlight continuously over a long period, we can determine the length of its year and the radius of its orbit. Combined with the star's luminosity and spectral type, we can estimate the surface temperature of the planet. (We'll come back to this later.) Moreover, if an exoplanet has a translucent atmosphere, or is a gas world, the light dims gradually, while one that is rocky and airless diminishes in brightness more abruptly. The graphs of starlight versus time, known as light curves, can be complex if multiple planets are transiting — each with a different dip amount, duration and interval, all summed together. Many stars exhibit inherent variability in their brightness, too, but the exoplanet transit dips happen much more quickly than those changes in brightness. The cone in yellow, representing the Kepler Mission's search volume, is only a tiny fraction of the Milky Way Galaxy. We now believe that virtually all the stars in our galaxy have planetary systems. The radial velocity method can also be applied to transiting cases, but it is used primarily when a planetary system is nearly edge-on, but not enough for transits to occur. The majority of the early exoplanet discoveries, mostly of heavy Jupiter-size planets, were made this way using ground-based telescopes. For situations where the planets are orbiting face-on to us, stellar astrometry is used to look for a periodic wobble, corresponding to the planet's year, in the star's coordinates. To aid in this work, the European Space Agency's Gaia spacecraft is currently mapping the precise positions of more than 1 billion stars and other objects. The Kepler mission and the main exoplanet detection methods are very well explained in two Space.com stories: 20 Years On, Future Bright for Exoplanet Science and 1,284 Exoplanets Found: NASA's Kepler Space Telescope Discovery in Pictures. Someday, with larger and better telescopes and some special tricks, we also expect to directly photograph exoplanets. Starting recently, some of the more prominent exoplanets have been given proper names. Otherwise, exoplanets are designated using their host star designation plus a lowercase letter, starting with "b" and increasing with discovery order. Most exoplanet host stars are faint, so they have hard to remember names like HD219134, from the Henry Draper star catalogue (see my April 11, 2016, column for more about star designations). The "Gliese" exoplanets orbit stars in the Gliese Catalogue of Nearby Stars, whose proximity to the sun make them easier to detect. Exoplanets discovered by the Kepler mission are all named using "Kepler," plus a number indicating the order of discovery, then the letter "b" (or higher, to indicate multiple planets in a system). "WASP" exoplanets were detected by the ground-based robotic telescopes in the "Wide Angle Search for Planets" network. Extrapolating from the numbers we have today, astronomers estimate that our galaxy could be home to 40 billion Earth-size planets, 11 billion of them orbiting sun-like stars! The habitable zone for our sun extends from Venus' orbit almost out to Mars. To avoid overheating an exoplanet, the habitable zones of hot stars have to be farther from the star, so the planet's year will be longer. But hot stars live fast and die young — some with lives spanning only tens of millions of years, which is probably too short to allow time for life to originate and evolve. Cool stars, especially red dwarfs, shine for hundreds of billions of years. Their habitable zones are compact, and there is plenty of time for life to arise. Unfortunately, orbiting closer to a star also exposes a planet to increased harmful radiation and space weather events like flares and coronal mass ejections from the system's star. Finally, the mass of the planet must be sufficient to exert enough gravitational attraction to hold on to a protective atmosphere and volatiles — elements and compounds with low boiling points, like water. Mars is not large enough to have kept its atmosphere and water for long, resulting in its cold, dry state today. It's not surprising, then, that scientists talk about the "Goldilocks Zone" for extraterrestrial life. The planet has to be large enough, not too hot, and not too cold — just right, for life! The habitable zone (the green disk) of our solar system is similar in diameter to that of the sun-like star Kepler-452. The cool-red dwarf star in the Kepler-186 system has a much smaller zone. The relative sizes of the planetary orbits, and artist's conceptions of the exoplanets, are shown to scale with our solar system. While exoplanets themselves are not observable visually, you can have some fun by looking at the host stars that are bright enough to see with the naked eye, binoculars and telescope (a naked-eye star is one visible without any special equipment). Here are a few to get you started. Use your favorite astronomy app to search for the named stars and/or Messier object signposts (in BOLD). Alrai, or Gamma Cephei, is an easy-to-see naked-eye star of magnitude 3.2 that is orbited by a hot Jupiter named Tadmor. It was actually postulated by a Canadian team in 1988, and would have been the world's first known exoplanet, but they weren't confident enough in their data to publish. Its existence was confirmed in 2002. Upsilon Andromedae is a magnitude 4.1 naked-eye star that sits above and between the brighter stars Almaak and Mirach in Andromeda. It is orbited, somewhat chaotically, by at least four hot Jupiters, and was one of the first exoplanet discoveries, in 1996. 47 Ursa Major is a naked-eye sun-like star of magnitude 5.0 that is known to host three hot-Jupiter-type exoplanets (the first of which was discovered in 1996), and perhaps some Earth-like planets, too. 51 Pegasi is a magnitude 5.5 star, visible with the naked eye from a dark site, that rises in late evening now and remains visible through fall and winter. It is orbited by a hot Jupiter, dubbed Dimidium, the first confirmed exoplanet around a sun-like star. HD219134, also known as Gliese 892, is a magnitude 5.6 star in Cassiopeia, near the limit for the naked eye but easy to spot with binoculars. It's about 4.5 degrees south of the open cluster Messier 52. It has seven Earth, super-Earth and Jupiter-size planets around it, and it's only 21 light-years away. Fomalhaut is a magnitude 1.2 bright star visible low in the southern evening sky from August into autumn. In 2008, the Hubble Space Telescope was able to image a circumstellar disk around Fomalhaut that included, for the first time, an exoplanet seen in visible light. Subsequent images have shown the planet moving through its orbit. The planet, dubbed Dagon, may still be coalescing. Wolf 1061 is a dim, magnitude 10 red dwarf star located in southern Ophiuchus. Of three known Earth-size rocky planets, "c" is just within the habitable zone, and "d" is marginally hospitable. At 13.8 light-years away, these are among the nearest Earth-like planets. It's only 39 arc-minutes northwest of the bright globular cluster Messier 107. The patch of sky analyzed by the Kepler mission is well-positioned for observing between now and autumn. Use your favorite astronomy app to search for the bright star Vega in the constellation of Lyra. Moving toward Deneb in Cygnus, look for the modest star Rukh, marking part of the swan's upper wing. In that 14 degree- square of sky between Rukh and Vega, are thousands of known planets! The free apps Exoplanet for iOS and Exo Planets Explorer 3D for Android feature an extensive list of known exoplanets that is kept current as new discoveries are announced. After the user selects an exoplanet from an extensive database, the Exoplanet app for iOS displays discovery data, system parameters, options to bring up animated discovery method and planet-size comparison graphics, a sky chart for your location, a top-down orbit diagram and more. The app stays updated with the latest discoveries. On the Exoplanet app's main page, select the Milky Way option to see a dynamic 3D rendering of the distribution of known exoplanets in the galaxy, then rotate and zoom in. A search option allows you to select a planet and fly there, seeing its system in motion. You can also fly to Earth and enable a mode that uses your GPS location and your device's compass and gyroscope to point out the exoplanets in the sky. Paid add-ons allow other types of objects to be added and displayed this way. In the Database menu, select a planet by scrolling through the list or typing in the search box. Each entry brings up a summary page from which you can navigate to a full page view of the detection technique, an animated graphic comparing the size and rotation rate with our solar system, a star chart, a plan view of the orbits for the planets in that system, and an extensive list of facts and figures about the planet and the host star. Clicking on the thumbnail image of the planet fetches a photographic image of the host star from the web. You can filter the extensive list by planet type, detection method, and sort using different parameters. I highly recommend this app. The Exo Planets Explorer 3D app also contains plenty of data, and will add new planets as they are discovered, but it's geared to the younger crowd, with an option to enable virtual joysticks and fly around the planetary systems. On the main screen, you can rotate and zoom a 3D rendering of the exoplanet stars in our local volume of the galaxy, and tap any system to fly there. Like Exoplanet, the database is searchable and allows for extensive sorting and filtering of the results. One useful feature is the 3D display of the habitable zone for each star, and an excellent rendering of the orbital inclinations of the various planets, all of which can be rotated and zoomed. Another terrific app. The Exo Planet Explorer 3D app for Android lets you search for any exoplanet and display its planetary system, complete with habitable zone and orbital inclinations, in a dynamic rendering that allows zoom, rotation and orbital flow. An optional data box displays data on each planet and the host star. 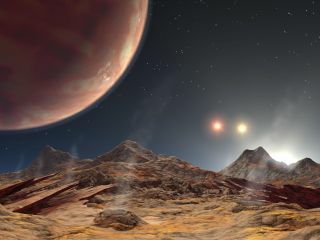 To learn about some unusual exoplanets, check out Scientific American's Top 10 Exoplanets, keep your exoplanet apps up-to-date and watch the science news as new discoveries are announced all the time. If you want to help in the search for exoplanets, you can sign up for the Planet Hunters program run by Yale University. After a brief training exercise, the online portal will display light curves for you to label with any exoplanet dips you may find. Your answers are compared with other individuals' and, if a consensus is reached, the star will be flagged for professional analysis. It's fun, and you are contributing to real science. There's plenty more to come in future editions of mobile astronomy, including astro-gadget reviews, advanced smartphone photography and columns about using apps to teach astronomy. Send me your ideas, too. Until then, keep looking up! Editor's note: Chris Vaughan is an astronomy public outreach and education specialist, and operator of the historic 1.88 meter David Dunlap Observatory telescope. You can reach him via email, and follow him on Twitter as @astrogeoguy, as well as on Facebook and Tumblr.